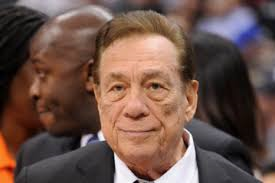 In a press conference held today, the NBA has announced that Donald Sterling, embattled owner of the Clippers, will face a lifetime ban. Shortly before NBA commissioner, Adam Silver, took the podium to begin his press conference, TMZ reported that Sterling would receive an indefinite suspension and a million fine. NBC Nightly News subsequently reported the same punishment would be handed down. Both outlets cited unnamed sources. Silver says the NBA has confirmed that it IS Donald Sterling's voice on the TMZ recording. Sterling will also be fined $2.5 million and Silver said he'll "urge the board of governors to exercise its authority to force a sale of the team and will do everything ... to ensure it happens." So Donald Sterling is banned, but does this mean his family is banned as well? There's nothing stopping him from giving the team to his family. I have so many questions.